Because we are creating our off-grid homestead from scratch and camping/living very rustically as we build, I frequently get asked the question, “How do you live without _____?” Blank, of course being lights or electricity or running water or a flush toilet. The funny thing is, that this way of living is so much my reality right now that I hardly even remember that it is unique. Of course, I also live on a road with two Amish farms, an electricity-free intentional community, and several other off the grid homesteads, so in my neck of the woods, this way of life is somewhat normal. So, today, I am going to try to explain exactly how manage living without electricity or running water or a flush toilet. You might be surprised! Our long-range plan is to install a photovoltaic system and get our electricity from the sun. But, too many other projects are ahead of this one in line, so for now we are electricity-free. This has been both delightful and challenging. Primarily for me, as a blogger and administrator who uses her computer as a tool, it is challenging to not have my desktop computer at our house. I currently have my computer at a friend’s house a few miles away, and she generously lets us charge drill batteries and store a few ice jugs in her freezer as well. Living without electric lights has probably been the most pleasant surprise for me. 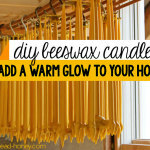 I have really enjoyed lighting with beeswax candles, using candles that we make ourselves (to learn how, see Making Beeswax Candles). When we need more focused light, we use a headlamp or a small, rechargeable solar lamp like this one. We do have a small marine solar panel (similar to this one) that we have connected to a car battery. With this, we are able to keep our cell phone charged, and with the addition of a bluetooth keyboard, I can keep up with comments on the blog, take care of my homeschooling co-op administrative duties, or search for recipes. We also have a chest freezer that is stored at another friend’s house, about 5 miles away. For this, we pay electricity each month, and make weekly stops to get meat or fruit for meals. Keeping food fresh in the winter is really not a challenge at all. We set covered pots of leftovers outside in our outdoor kitchen, have coolers outside as well, and keep a few items close to the front door, low on the ground, where the temperature is cool. Our plan is to build a root cellar in the coming years and use that for cool food storage. Finally, we have a portable generator that we use for power tools and the occasional batch of hummus or a smoothie. Last summer we used an outdoor kitchen, cooking on a Rocket Stove and a two burner propane stove. This winter, we moved the propane stove inside to the kitchen, and cook on it and on our wood stove, a wonderful Jotul that we brought with us from Oregon. Honestly, if there is any one comfort or luxury that I really miss, living this lifestyle, it is an oven. However, I have mastered how to bake in a solar oven, and also several unique ways of baking without an oven. I’ve talked a bit about our water catchment system, in this post and this one. When we bring water indoors, it sits in 5 gallon buckets or big metal pots, and we use measuring cups as scoops for whatever use. Below you can see our unfinished kitchen counter, complete with sink. The water simply drains into another plastic bucket, and is emptied outdoors. Baths are taken in front of the wood stove in a big galvanized steel tub. It’s so very Little House on the Prairie! 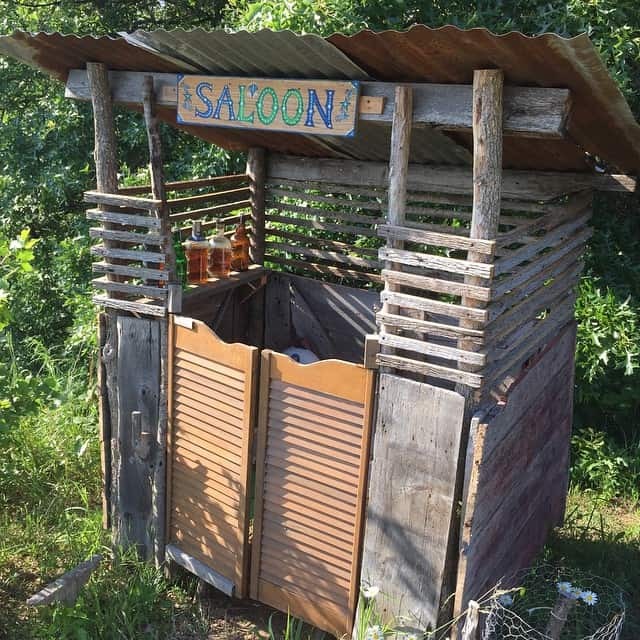 No rustic off the grid homestead would be complete without a composting toilet. It’s such a pleasant experience to take a stroll to the outhouse this morning and admire the wonderful hillside view. So there you have it! Radically simple living, explained. If you’re interested in learning more about how we created our off the grid homestead from scratch, please check out my eBook, Creating Your Off-Grid Homestead. How do you think you would do living without electricity, running water, or flush toilets? Teri! I was just thinking about you and our email exchange last summer. so fun to visit your blog and see the new place. hope you are having a lovely cozy winter! you are an inspiration! someday…. So nice to hear from you, Sara! Thanks for saying hello, and I will have to read up on your blog too! As usual I am enjoying your posts! 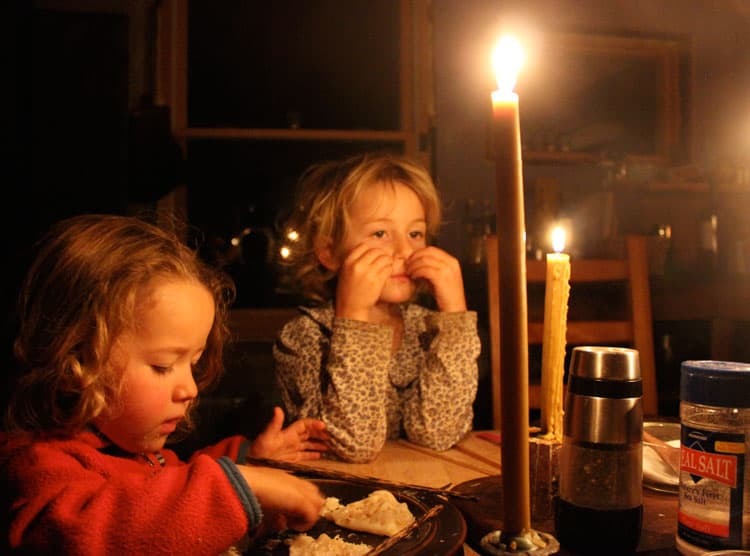 We also live off grid, have for little over a year now , using oil lamps, candles and two battery operated lanterns for light. We have the toilet set-up as you, tho ours is indoor now. We bathe like u except in a claw foot tub 🙂 we cook on a propane grill – which we can bake in thank goodness cuz I too love to bake-or wood stove. I plan to build a rocket stove and solar oven also. We use coolers and a zeer pot for a “fridge” We do run the generator for tools and the occasional dvd. Until our well is built in a few months we haul water from a friend’s place. That is my “scene”. Love reading about yours!! Sounds like a great set-up, Tami. I am thinking about bringing the toilet indoors. The kids don’t like to go out in the cold, and who can blame them on these 0 degree days! The rest of what you describe sounds awfully similar, although you definitely sound a bit more comfortable! Hi! I just stumbled upon your blog and love it. 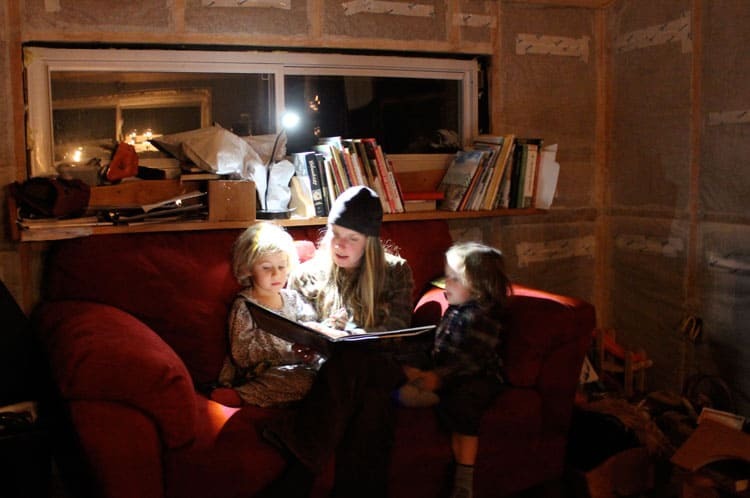 My husband, daughter, and I live in a yurt and from what I’ve read, we live a life similar to you and your family. I’m excited to read more of your blog. Thank you for writing – it is encouraging! Nice to meet you Tara! I have lived in a yurt for a few winters, such beautiful spaces. Thanks for saying hello! Hi my name is Tim, my wife stacie and I have talked about living in a yurt with our 5 kids.would you be willing to share some pictures and experiences from living in a yurt ?? We currently have a small farm with a couple of pigs, jersey cows, meat and laying chickens, meat rabbits and 5 dairy goats. I work full time and my wife stays home with the kids. Any ideas you could give us would be great. Thanks! Hi Tim, I did live in a yurt, but in the days before digital cameras (and kids!). My experience was very unique to where i was living – the winter was cold and the stove was not sufficient for the space, so I was very, very cold. I think yurt dwellers get to be very creative about how to create living spaces that respect everyones’ need for privacy and togetherness. My guess is that there are lots of Pinterest boards about yurt living that can address your question better than I can! A tiny house is certain similar to yurt living, but we only have 2 kids, and I already see that we’ll need more space as the kids get older. Good luck! I love peaking into the way you live! I have to say I love oil lamp light to electric lights, but like you said the computer and power told would be difficult to give up electricity all together. What solar chargers do you use? I might have my husband finally convinced to start putting away for a small wind generator and/or a couple solar panels. In the long run, I’d like to see these as our back up for when the grid goes down to power our chest freezer and furnace. However in the mean time if I could charge our laptops and cell phones via a little solar panel it would be a dream come true for me! Question about your toilet set up: Couldn’t you use your household waste water (like from the kitchen sink or used bath water) to flush your toilets? I remember the well pump not working at a cottage once and we just poured water into the tank after each flush. The bowl cleared every time.I’m just wondering if this could be a regular set up to allow you to move the bathroom in doors? Yes, the little solar cell phone chargers are not pricey and they work great. I don’t know which brand we have, but it has two USB Ports. And yes, if we had a flush toilet we could use grey water, but we are not planning on installing a septic system at all. I think we will figure out a long term indoor composting toilet when we have a bit more space. Thanks, Kris! We have been experimenting with Dutch Oven baking recently, and also discovered a stovetop cobbler, called a “slump”. I have bought solar chargers at Academy. While a tiny $10 -20 sounds good they are only effective for more of emergency use like adding 10% to your battery and thats it. Spend a little more and theyre great for camping and also effective off grid as well. Just remember the phone has to stay out of the direct sun to avoid overheating. Yes, That is a good tip. We also have learned that we need to keep our phone out of the cold as well! We now have the solar charger mounted to our house, and the cord comes inside through a window. It works really well. Our charger was about $50, and it does keep the phone fully charged on sunny days. And it keeps it from dying on cloudy days! 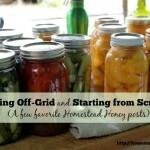 Enjoyed your blog post, we don’t live off the grid yet here in MO. but we hope to soon. We heat with only wood in a 3000 square foot house and we have a wood cookstove in our kitchen along with the electric. 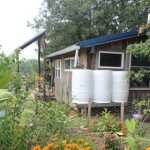 We catch rain water for many uses which also feeds the chickens and rabbits. Our garden is very large and we will be expanding it this year along with having a new greenhouse this spring. For the past two years we’ve been collecting solar packages to use for lighting and we do have a gas generator for emergency for the freezers and refrig. but I hope to remedy the food storage soon. and we have an outside composting toilet. 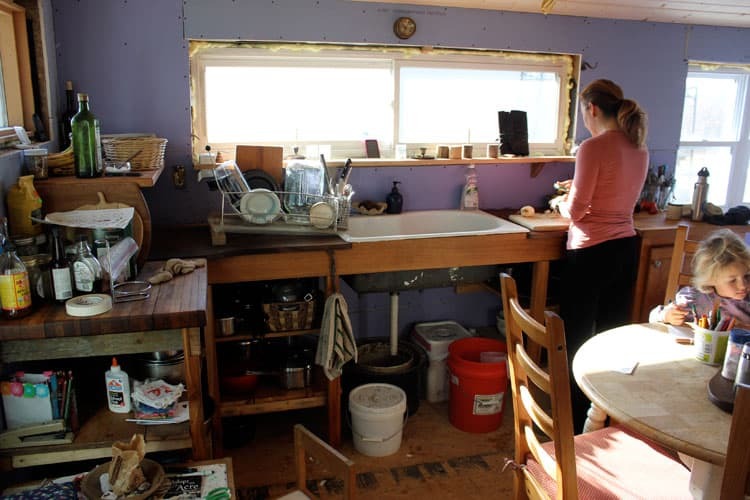 We can bake in the wood cookstove, my husband has been cooking on top and in the over since he was a young boy so he’s a lot more advanced at baking in the woodstove than I.
I enjoy your stories about your living off the grid, it’s inspiring to read. Thank you for sharing. Thank you for sharing your experiences! Sounds like you have a great set-up! We do plan to get a wood cookstove some day. This house is too small for a large stove, but eventually, we’ll live in a larger space and will plan for the cookstove. Love them! Enjoy your garden and greenhouse! We had a wonderful greenhouse in Oregon, and left it there. But I hope to get another one very soon! I totally agree with you Andrea. We have a truly glorious view from our outhouse, and it’s such a pleasure to take a few moments to really enjoy the natural surroundings around us. I just noticed that you use the same solar lights from Ikea as we do. 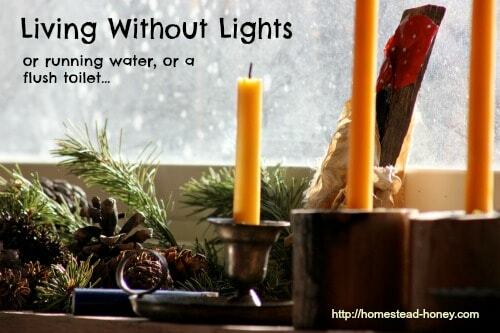 Every household with limited electricity should have a couple! Yes, they are fabulous! And only $20! Yes, we would like to make a cob oven some time very soon! 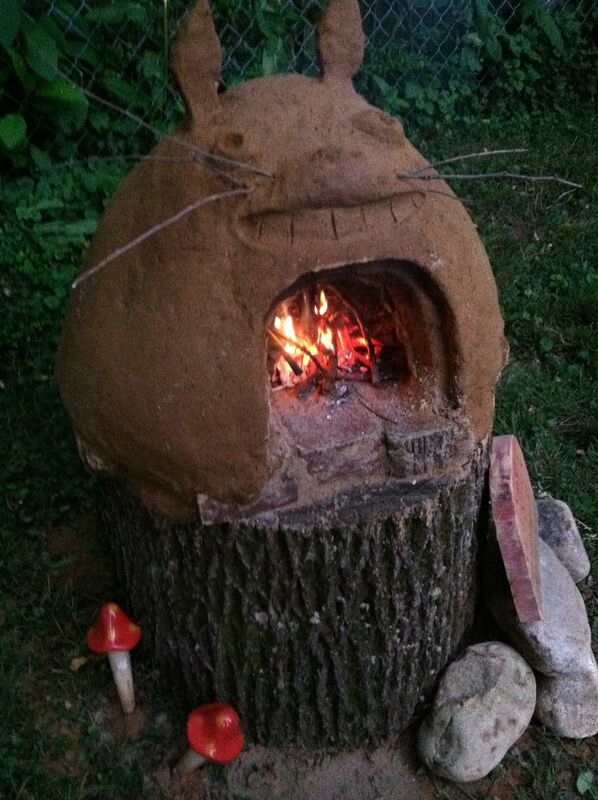 My husband actually used to be a professional bread baker, and built a wood-fired brick bread oven, but we had to leave it behind when we moved from Oregon to Missouri. It’s high up on the priority list! Thanks for sharing your experience! We lived like this for a total of 6 years. We learned a LOT about thrift, simple living and gained a love for the quietness within a home devoid of all the noise makers (did you know electricity filled homes have a hum). We Started our baths in a rubber tub and after 2 years finally realized a 2 to 5 gallon bucket with a spicket attached to the side bottom used way, way less water and less work for our family of 6. We started with candles and head lamps which in the winter months raised our money output. By year 3 we had solar!! YEah!! Gone were the days of being blinded when 5 heads looked up from their books to listen to your question. 🙂 We collected water from the roof and after 3 years attached a solar ran pump Oh what a joyous day when the kitchen sink carried the water through the faucet! On the 3rd year we also went to a propane icebox ditching the old cooler filled with ice. Enjoy the simple life! I really appreciate hearing your perspective, Jodi. It is a long haul for us, as we’re doing all the work ourselves and have two young children. So some of the projects that we *thought* would get finished this year, did not. Some of the choices we have made, we will likely continue into the future. Some, not. For instance, I really love having candles in our home, but since I use my computer for work, I want solar panels to power the computer at home some day. And running water into the house – yes! But it’s all a process, and it takes time. I appreciate hearing from someone who has already been there! Good for you! Your children will cherish these times when they are older. You are making wonderful memories AND becoming more sustainable. Thank you Rachael! It’s funny, out of our whole family, my six year old daughter is the most adamant that we ALWAYS live without electricity! She loves it. Everett is only three, and hardly remembers a time when we had lights in our house! 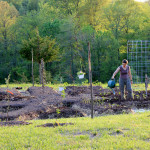 I just love reading about your homestead! I have always admired folks that can go totally off the grid that way. I am not sure I would do so well as you! 🙂 Little House was my favorite show forever and knowing that there are modern folks doing it that way is so very inspiring! Thanks for continuing to share! Thank you Lauren Ann! We have been reading the Little House series with my 6 year old (as I did when I was a child:)), and it’s so amazing to me that they lived this way and then MOVED so much! It’s hard enough settling in once! We lived this way for a few years. Now we have power and water but that’s it.including the unfinished rooms! We don’t live in a area where people we know do this so that was and is the hardest part. People felt that we were depriving our kids and asked us questions with criticism. I never felt my children were deprived. They play in the woods, get dirty and are tired at the end of the day! I am fascinated at the multitude of ingenious ways people like yourselves have disconnected from the grid. I think there is as much a spiritual motivation for doing so, as there are environmental and financial benefits. The closest I have come so far to living off the grid was living for almost 4 years in my sailboat moored in Vancouver, BC. A sailboat is a great introduction to independent living. I grew up working a 3 acre garden that fed our entire family as well as earned mother house-money selling the surplus vegetables after we’d frozen and canned enough to last us the winter. In recent years, living in Quebec I’ve grown quite fond of my 1920 Belanger wood kitchen stove. While we are still “connected”, we do heat and cook only with wood except when we have B&B guests in our rambling 1917 brick manor. We also offer restaurant meals by reservation only and again, all the cooking is done on the wood stove. We have 3 floors including the basement, each some 2,500 sq ft per floor situated on almost 4 hectares of land. We expect to use approximately 35 cords of wood heating and cooking this winter. Remarkably, this house was built 25 years before the area was served by electricity. The house was built in 1917 and the original family was entirely self-sufficient here in the 20s running a large dairy, generating their own power, first with a windmill, then a generator attached to his water driven saw/flour mill, that provided more than enough power until those services arrived in the 1930s. All this to say, despite the enormity of the house, we are planning to once again install a wind generator, and in fact have found the original tower at a neighbour’s. Due to the much greater electrical demand we have today (restaurant fridge and washing machine, etc, we hope to install a major array of solar panels either on the house roof or the barn. In effect, we are developing a plan to reverse this property’s development and return to its pre-electicity past. Also this summer we plan to dig a Walapini, a passive solar heated greenhouse that I first saw while in China, which despite our northern clime here in Quebec, Canada, in theory it should produce all winter without external heat. Next to the walapini, we are putting in an 80ft by 80ft vegetable garden and a separate potato garden. We currently have both wood heat and an efficient electrical hot water heating system. We are assured that a large external wood stove would provide ample hot water for the house heating system, as well as a slab in the garage. I am already raising ducks, chickens, rabbits and goats. From them, we have unlimited eggs, milk, and if am able, even meat. SO in theory we will eventually be energy independent except for the wood. We have a growing B&B and restaurant clientele, as well as my ESL teaching clients, the earnings from which should provide for the annual wood supply. Our forest is not large enough to be sustainable. The only issue I have not resolved is the septic tank. When I was a kid, we ran it on the garden between the rows once a month, and in the winter, we banked up snow and used it to make a skating rink. However, I cannot imagine the neighbours letting me get away with that here and now with various by-laws. Mind you there are new septic systems like the “eco-pure” peat moss bio filter that only needs to be changed every 10 years, that apparently releases water that is “almost” potable. Anyway, enjoy learning from your adventures and welcome your comments or suggestions as to whether it is feasible to go off the grid on such a large scale. What do you all think? PS, We had an outhouse until I was 5 and I DO NOT have any fond memories of that! I prefer to let it break down and recycle it into our garden if I can manage it. A friend has a compost toilet at his cottage that is completely odour free and could be used indoor or outdoor. I understand that urine, diluted 1 to 5 with water (or grey water) is a perfect source of phosphates for the garden. Wow! The sailboat, the B and B.what a great series of life adventures! As for the septic, I really don’t have experience with a a system, having used a composting toilet for the past 15 years. Best of luck with your home and biz! When I lived in Costa Rica years ago I rented an apartment without an oven. I discovered that I could turn a large pot upside down over a burner and use that as an oven. I was using an electric hot plate. I am sure it would work fine on your wood stove. If it gets too hot on the bottom, try putting the pan you are baking in on a brick, then placing a 5 or 10 gallon pot over it. That is a great suggestion, and seems so simple! Thank you! I started out like this in NE MN….chopping holes in the river for water for baths (after shoveling a trench to the river to carry the pails back on)…wood heat…no electricity….it did’nt take me long to realize that i needed a sauna and that electricity of some kind (solar or a generator) was essential. I lived for years with the sauna and had a drilled well by then (potable water from a good well beats the bacteria guessing game from river water) and solar for a radio the last five years….then i had an opportunity to get the real thing….ELECTRICITY!….different world now….bathroom in the house….off peak electric heat…i’m well insulated and can’t really tell that it’s -26 as i write. I dream of a place in a warmer climate but will proably end up spending the rest of my life right here. That sounds like quite the adventure! We will be getting solar panels at some point, and I expect it will make some things a lot easier, especially computer and phone use. The water system we plan to install will basicallly be a large underground cistern to hold more water, to weather drought. Possibly multiple cisterns or systems to accommodate animals and gardens. Thanks for sharing your story! When we retired my wife and I started out on an unimproved piece of remote mountain land. Without access to modern conveniences due to location they were and are still unavailable. We now have solar and wind electric generation with generator back up. We have gravity flow water and indoor plumbing. Satellite uplink for internet. We have gardens all around the cabin in every direction. It took years and much work but it was worth every bit of it. Your family has embarked upon a journey that will teach you much about yourselves and the world you live in. Cherish the journey. It will be the best time of your lives. Thank you for writing, Jim. I do believe that these will be the most memorable years of my life. I wouldn’t trade them for anything. Just the experiences we’ve had so far have given me a huge new appreciation for the comforts of life, and have made me realize that I am far more adaptable than I thought. Best wishes to you in your beautiful home. So it sounds like YOUR life off the grid was necessitated by your remote location? I am trying to identify what are peoples’ primary reason for living off the grid. When we first moved to Missouri, we did plan to install a solar electric system, but probably would have hooked up to the grid for water and power to a shop. But our building location made hooking to the grid cost-prohibitive. So we reconsidered and decided to try to go without, and see how it worked for us. As far as what keeps me going when times are rough (and there have been many days when I just want a hot shower), is that there is a simplicity and peace to living a bit more off-grid that just feels right to me. I still have a car, I still have a smartphone, some day I will have solar, but all in all, our life is vastly more connected to the rhythms of nature, and that feels really good. I also love saving money not paying bills to utilities. Thank you for sharing your experience. I am trying to clarify for myself, before embarking in a big way, what exactly are my own primary motives. I KNOW fro growing up with a very large garden and animals, that they are a LOT of work, yet I continue heading down this road. But before my partner and I have spent a lot of money adapting our home and our life off the grid I am trying to connect with my REAL motives. As I KNOW I will need to remind myself why I am here, in the middle of winter, when it is cold inside, and out from conserving energy, despite sweaters, or I am hauling pails of water to the goats before I milk them, or weeding our new large garden. I get the feeling many are off the grid as it is a less expensive way to live, some are off the grid simply because of their remote location. Among those who are off the grid simply by choice, what was your primary motivation? What was that choice about? Thank you all for you comments. We too live this way(almost the exactbsame as yall except we dont have the chest freezer at neighbors-i wish) and we made a shower out of pallets. We love our life and it does feel normal, we forget we are unique as well. Good to know we are not alone. Check us out on facebook! Sounds like a great set up, especially the shower! Do you use that in winter too? We are slowly working towards returning this hundred year old property back to its completely self-suficient beginnings before electricity and supermarkets existed. http://www.aubergetaylormanor.ca It was built in 1917 and generated its own electricity via windmill, then a generator connected to the overshot sawmill until electricity arrived here in 1938. The family also grew all its own food and meat and heated with wood from their own forest lots. As I am trying to understand my own motivations for our off-grid goal, I was wondering: Can anyone out there offer up any comments as to your primary motivation for this, at times, trying and difficult lifestyle by answering a little survey? When the going gets tough and you ask yourself, WHAT ARE WE DOING; for YOU, is it about a) living on a limited income?, b) living a healthier chemical free lifestyle?, c) helping the planet by reducing your carbon foot print?, d) living more sustainably in general?, e) all about feeling more independent?, f) Other, please specify? If you wouldn’t mind commenting and putting these 6 points, (or others I have not mentioned), in order of importance. I look forward to an interesting exchange. It’s about all those things James, and don’t they change over time? Yes I suspect all of the above is a common sentiment, but which reason prompted you to leave the modern world behind and go off the grid? And WHICH is the reason that keeps you from giving up when times are tough? James, I would say that all 6 of your points are reasons why we have been working to build our own homestead and live off-grid. So much of our modern culture just doesn’t make sense to me, and living in harmony with the earth does. I am always striving to reduce my impact on the earth, and I have a long way to go. Some things are important to me now, and may not be in the future (for instance, living super rurally, it is important for me to have a car), and I will continue to reassess as we go. Thanks for bringing up these great points. I signed a lease for an older home to find that it had no water or power. I am trying to live in it because i have no other place to go. It has been difficult especially the night-soil buckets. I also dislike the smell of kerosene lanterns. The place is as cold and dark as a mausoleum and just as unpleasant. How can anyone actually embrace this kind of life? I’m sorry to hear that it’s so unpleasant for you. I think your comfort level would be greatly improved with better tools. For instance, we use beeswax candles and solar lights that are very pleasant to be around, both in terms of lighting and scent. We also have a wood stove – is that an option for you? I really wish you the best and hope that your situation improves and that you can experience the beauty of living in radical simplicity. You will need a heat source. If only to manage humidity. A simple box stove is affordable and depending on your location, you may be able to scrounge some wood on your property or look into the going rate per cord to buy it pre-cut. The Manor used more than 36 cord of wood last year but a much smaller home shouldn’t need more than 10 or 12 cords, again depending on your local. Kerosene lamps are easy to come by and the new lamp oil has no smell. When it is warm enough outside, open up the doors and or windows and ventilate your space. as humidity builds up and condenses if you are not keeping your space at least 60F, it can accumulate mildew. Once you have solved the riddles of affordable heat and light, you can begin to see what you property can contribute; a goat for milk and compost, a 1/2 dozen hens for eggs, rabbits are quite affordable for meat, as well as male goat offspring, always keeping the females for milk, from which I make yoghurt, and ice cream. Low start up cost solar panels with a battery and inverter can get you enough power to operate a small bar fridge if you have no cool basement or cold room to keep things fresh. Feel free to contact me for more ideas and best of luck! Thank you, James for your reply. I appreciate your advice to try and find a silver lining. I must dig deep and keep strong, and keep my head up as much as possible. James, this MIS-adventure was quite unintended. For financial reasons I leased the old home because it was available very low cost. Only after all my things were moved in did I discover the lack of basic utilities. I am a 49 yo woman with an 11 yo son in school. The existence you describe would be possible with a man’s help, but not us alone. I can’t even let my son live here because I would risk losing custody of him. He is staying with his brothers, my older sons, until I can figure out what to do. Just as a form of therapy, I planted a short row of spring veggies in the yard. Turnips, mustard, radishes etc. It pleases me to go out and look at them every day. I tried to follow your advice and burn wood in the fireplace but it has been rainy here lately. Good for veggies but not for firewood. Also since I have no chainsaw only small wood is feasible. I am in quite a spot. May I know your name? And approximately where you live, ie climate. I’m writing you from frozen Canada. I assume your climate is much milder. I would focus on your essentials. People all over the world live a subsistence life. We have just become disconnected from our own real personal needs. I would look at what is possible and available starting with the essentials. You seem to have access to the Net so look for the easiest options for a cooking heating device. I made one at camp by cutting strips of cardboard, winding it around itself and setting it in a pan, foil or baking dish, no mater, then you cover the cardboard with melted wax from candles or parrafin wax bars from the supermarket for canning. You light it and it works brilliantly as a hotplate and will provide heat and light.I see much about simple homemade rocket solves that produce tons of heat with very little wood,even just sticks. You need a reliable heat cooking source. With that you can boil water for cooking or for washing clothes that you hang to dry. If you can manage to scrounge a hen or two you’ll have an excellent source of protein in the eggs and they can almost take care of themselves, eating any scraps from the table. Just be sure they are safely closed up at night away from predators, even inside with you. Home made bread is easy and you can fry it instead of baking it. There should be plenty of greens of one sort or another on your property. Just be cautious with first tastes, Dandelions are very good for you. Why not let me know of your more immediate needs specifically so I don’t have to guess how I can best help. oh my ‘been there- done that’ LOL so like our early years here! wasn’t our long-term goal but it is doable! we also want to be off grid but other priorities have taken place, but your posts help me keep it in mind and stay hopeful – someday ! It’s hard to find the money to invest in the infrastructure you need to live off-grid. We’re taking one step at a time, and are okay living rustically, but knowing that we have certain needs, like a computer and freezer, that need to be addressed sooner, rather than later! You’ll get to your final goal!! It seems to me everyone does everything the hard way. We use a thermal mass heater of the Russian bell design made from free mud. It used 1/3 cord of wood per year in zone 7. You burn 7 sticks and the house is toasty warm with radiant heat for 24 hours. It bakes bread for hours after firing, heats water. Most hot water is made on demand using a Kelly kettle and poured up for a bucket shower or dishes. Summers provide free hot water in an unpressurized home made 100 gallon insulated tank through which water is circulated over the tin roof, into a gutter and back to the tank. 4000 square feet growbio intensive garden feeds 4 people 100% with goat milk and eggs free from rotated stock. After 4 years fruit, nut, avacodo trees are beginning to fill our diets and will meet all our food needs including high quality protein and fat; with virtually no labor. The fertilize themselves through legume trees in a permaculture fashion. Food is dehydrated in a 4x4x8 solar drafting oven or smoked. Refridheration in not used at all. When ice is needed a chest freezer with brine freezes 5 gallon buckets of water using power from a bank of used super capacitors (which do not need replacing like batteries) charged from three 280 watt solar panels. With an inverter battery tools and led lights are charged. House light comes from LEDs powered with a joul the if circuit and more capacitors. Well water is pumped via capacitors/220 volt inverter into a 8′ high 300 gallon tank. Gravity then provides water to house and taps. The pump is only run once or twice a week unless watering the garden or trees. It took a lot of work to set up, but man it ain’t hard at all anymore! Not at all.. I think you guys like to suffer. BTW if you pay more than .65 ¢ cents per watt for solar you are being ripped off. Sounds like you have a great set-up, Dan! 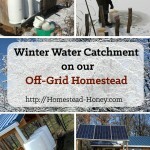 I’m glad to hear the details of how you make living off-grid very comfortable and productive. I do want to say, however, that my family is not suffering at all! On the contrary, we’ve enjoyed being able to take our time and make decisions that feel right for our family. If we hadn’t lived without electricity in our home, we would not know that we don’t need much of what we formally thought we did. But, on the flip side, I now know that I really do want to have a computer in our home, etc. We began living on our homestead just a year ago, so our progress has been keeping in pace with a family using cash only, with one builder, and two children under the age of 6. I have no doubt that we will have a similar set-up to what you describe, but it’s going to take time. I would love to learn more about installing a solar system using super capacitors instead of batteries. Any information/links would be great! I don’t know anything about super capacitors, although you might check out Backwoods Solar. Wow! Living without those things? I can’t imagine! Beautiful blog… It’s amazing how you able to managed. But you still have a choice to live much better and much comfortable with your children. 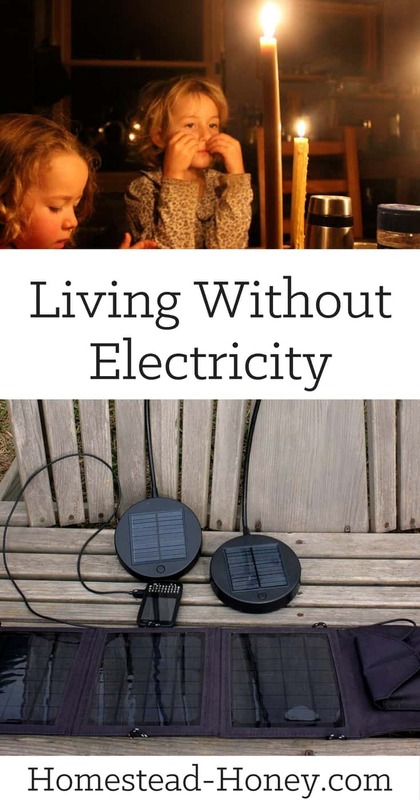 It is funny – the longer I live without electricity in our house, the less I feel I need it. We have, in fact, just purchased solar panels that will give us enough power to run a chest freezer, a computer and a few other small pieces of equipment, but I’m not convinced that I need to add lights to the house. It’s just so nice and peaceful to not have artificial light or sound in our home. And my kids love it much more than me, since they have no need for a computer! Great info here. We have a little homestead but not off the grid. To help you out in the baking arena, I simply bake bread in a dutch oven inside our wood stove. I use dough from one of the no-knead bread recipes from Healthy Bread in 5 Minutes A Day (which I keep stored cool in our root cellar for up to 1 1/2 weeks) form it on parchment. While the dough warms and rises a little, I put the dutch oven inside the woodstove on a couple of fire bricks to get hot. Then I take it out, plop the bread in with a tablespoon of water and quickly put the lid on (the steam makes a nice crust). Put it in the stove and take it out in about 15-20 minutes depending on the temp, etc. The only challenge is that when I get the fire low enough for baking in the woodstove, I can’t do much cooking on top. But I can keep a stew warm until the bread’s done! That’s a great idea, Sarah! I am very excited to try this out. My husband used to bake in a brick wood-fired oven that he built, and he always sprayed the insides of the brick wall with water before closing the door – I agree, it does make a fantastic crust! Thank you for sharing your method! Very nice information you have share. Great post, I loved reading it! I get asked the same question, except I am pampered compared to you. We live off the grid and use a dry composting toilet in our outhouse, and everyone who I talk to is always so concerned that we do not poo or pee inside. It makes me giggle a little sometimes with the way people respond to the thought of not being able the flush “away” waste. Anyhow, enjoy your GREAT way of life, your kids are so fortunate to have such a simple life. time!!! Solar shower made for camping, laid out to warm in the sun kept me clean! I so miss this life….. Like you one thing I missed though was an oven! Thanks for bringing back memories of wonderful times! That sounds so wonderful. I lived in Kenya for 6 months, and it was one of my life’s greatest experiences, and probably very influential for how I live now! I admire that you’re living as humans did a long time ago, with little impact on the planet or consumerism in general. I mean that, I admire that you have the fortitude to DO IT and not just think/talk/plan but never actually do it like many people do. I have a question: In my area there is an argument that “people who live off grid”, yeah “them” as in us and “them”, are costing everyone else money because they don’t pay their share of utility costs(roads, sewers, infrastructure etc). The people pitting us against “them” is the companies themselves, they actually believe that if someone avoids their services it is hurting everyone else. They are also, seemingly, very willing to meddle in your business over time to cause you problems, surprise inspections, bills for non-existent services and if kids are involved regular complaints to child protective services, according to various news reports. Have you had to face any of that type of backwards accusation or deal with protective services in any way? If not, how do you avoid them? I know you aren’t doing anything wrong but in today’s society anyone different causes concern for overly politically correct folk. I’m off to read more of your blog now, thanks. Good question! To the first question about not paying for “my share,” I pay taxes, just like everyone else. I buy gas for my car, so I’m paying into road taxes. If I chose not to purchase a service (water, electric), that is no different than me choosing not to have cable TV. But the child protective services thing is something that really upsets me. Living off-grid is a very conscious choice for simplicity and frugality (not values that are encouraged in our culture). We happen to have a large Amish population nearby, and except for the electricity in my home, we live very similarly. So, fortunately, we have had no accusations or complaints. But I have read some fairly nasty comments about my family when some of my blog posts have been shared widely. It’s very sad. If someone spent one hour with my family, they would see caring, well-educated parents, and creative, intelligent, and capable children, getting to spend lots of time together as a family because we’ve chosen to do things a bit differently.